How would you like to win gin? I knew that would get your attention. Even if you don't win I've got an exclusive discount code to share so all in all its a win win gin situation. Try saying that after a couple of G&T's! 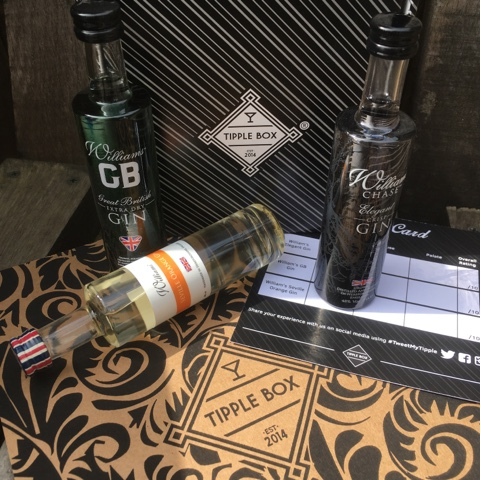 I've teamed up with my friends at Tipple Box to celebrate their re-branding and launch of a Spirit Box and Marketplace in addition to their existing Cocktail Subscription boxes. Believe you me there is nothing better than receiving cocktails in the post. Beats an overdue bill any day of the week. 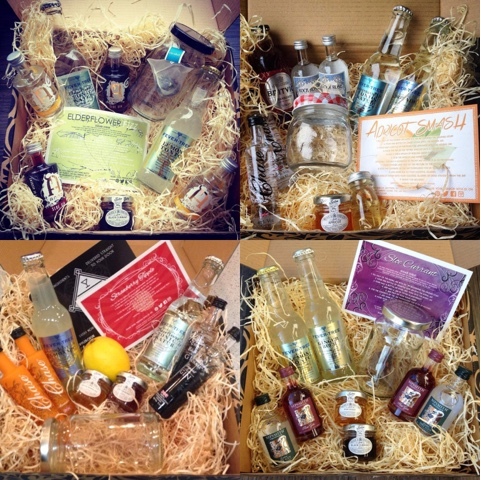 Edinburgh based Tipple Box launched via a crowdfunding initiative at the end of 2014. Since them I've managed to sample a fair few of their Cocktails by Post offerings. Hic! For £24 a month Tipple Box will deliver a box of craft cocktail ingredients straight to your doorstep. Each box contains the ingredients for two expertly curated recipes alongside four exciting 5cls of spirits. Just shake (or stir) and add ice and friends! In my humble opinion this concept beats an organic veggie box scheme hands down. I've been really impressed with the quality and variety of premium brands contained within the boxes. The miniatures are a great opportunity to try a new drink before splashing out on a full size bottle. Admittedly not all of the Cocktails have been exactly to my taste but I've had a great time making and drinking them none the less and you can always get creative and adapt the recipes to suit. 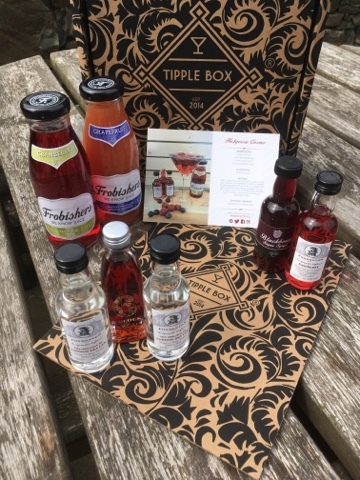 If you fancy yourself as a bit of a Tom Cruise in the Cocktail department FOODIE10 will give you £10 off a cocktail box at www.tipplebox.co.uk The discount code is valid until 31/08/16 so makes your first box only £14. They've also now launched a separate monthly spirit discovery subscription with a £15 price-point. Each month you'll receive three 5cls of exciting new spirits (mostly gins, sometimes vodka) from small batch distilleries. Perfect if you like your spirits straight. The good new is that FOODIE10 will give you £10 discount there too. First box for £5? Slainte! 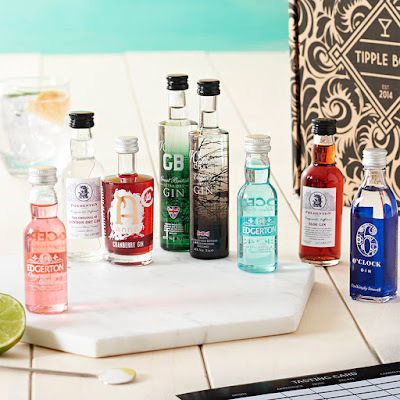 Tipple Box have provided a Great British Gin Tasting Set worth £39.99 as a giveaway for readers of Foodie Quine. Entry is via the Rafflecopter widget below. To enter, let me know in a comment "What's your favourite Gin?" For additional bonus entries you can follow me and Tipple Box on Twitter, Tweet about the Giveaway or like me on Facebook and Instagram. Bombay Sapphire is my favourite gin. Good choice - I'm a fan of Tanqueray too! Gordons is my favourite gin. Bombay Sapphire is the best gin. Excellent choice! It's earned a place on my Gin shelf. Hendricks with a slice of cucumber! so refreshing! Oh yes - I love this one. Especially combined with Prosecco. Haven't tried this one but sounds like it would be up my street! I tend to buy Hendricks, but love mine with a splash of Elderflower cordial! Haven't heard of that one. Must investigate! I've never been able to find any damsons to make my own unfortunately. I really love Silent Pool Gin, it's a British one that's made in Surrey, not too far from where I live. It comes in the most fabulous blue and gold bottle - so pretty! It makes such a good gift. I've heard of it but not tried it. Off to go and look and see what the bottle is like. Thanks for the tip off. I'm not sure what the brand is, but my grandfather bought me a damson gin from his local Christmas market last year and it was absolutely beautiful! Good Choice! I've got a bottle of it on my Gin Shelf, plus a jar of their Boozy Berries. Six o'Clock Gin is brilliant. Gordon's Gin is the best! Gordon's Gin is my favourite. I drink Hendricks with a slice of cucumber, it's great! So hard to pick just one favourite gin when there are so many out there! I love Ophir just now. Yup I've got a bottle of that on my Gin shelf. Love the Elephants! Gordon's Gin is my favorite! Haven't heard of that one. Off to investigate! Martin Miller - lovely lemony fragrance and what got me started as a gin drinker! That was the first artisan gin that I ever bought! Oh I haven't heard of that one. Shall have to investigate! Oh favourite is hard, Rock Rose just beats Caorunn or Eden Mills Love gins. I'm a fan of all three of those! Rock Rose Gin, a wonderful Scottish gin in the most adorable bottle! I really like Hendricks gin! Hendricks is by far my fav so far, but I love trying boutique brands. Gordon's is my favourite gin. I like Ophir gin, and I love the bottle, so pretty! It has to be Six O Clock Gin from Bramley & Gage! I rather like a drop of Hendricks! My favourite is Blackwoods but it's so hard to find in the local shops and supermarkets. Gordon's, but I haven't tried any others! Anno Kent Dry Gin - AMAZING! Plymouth Gin is my favourite. Has to be Gordons, first Gin I ever tasted. Bombay Sapphire gin is my favourite. Isle of Harris, although other close runners are Hoxtons and City of London. Sipsmith gin for sure! With elderflower tonic! Just one? Harris Gin for me, for now! I'm more of a vodka girl, but the other half likes Sipsmith....at least that's what he gets bought! Bombay Sapphire but I'll try any! East London Liquor Co's special batch #2- such a clean, herbaceous gin that pairs well with fresh sage! Was my Granny's sloe gin, but have to say Pickering's is pretty darn good and it's made down the road. Also, cannot believe I haven't seen this blog before! Awesome! Bombay Sapphire, but I'm happy to try more to find a new favourite! Bombay Sapphaire, but always willing to try something new!! I do love a Gordon's but I am extremely partial to Hendrick's! Not a gin drinker myself. Friend is, and likes Bombay Sapphire.